I'm all up for toddlers on tour – don’t get me wrong. My only problem with sought-after family destinations is that every family wants to go there – and, let's face it, who wants to fly halfway round the world in search of paradise only to share it with every other playground-jaded parent? My trick is to get there before you do. I test-sample my idea for a family trip with other mums. "Sounds fantastic," they reply. "Where is it?" Clear winner of the "got one over you this time" poll, I slope off to confirm flights for myself and my son to Grand Cayman. One surprisingly effortless direct flight later, my son and I sweep through the Grand Cayman Beach Suites lobby, past a queue of wilting guests. We make short work of unpacking. Factor 50 suncream, check. Sunglasses, check. Itsy-bitsy swimsuit, check. In less time than it takes to crack a coconut, I am slung in a hammock sipping a cocktail, George ping-ponging his way along the shoreline at Rum Point trying to catch fish in a neon bucket. Brilliant sunshine streaks across the ash-blonde beach like good news. We like what we see. Still, getting under the skin of a place matters to me and by the next morning I'm gagging to "do" the island. I've all but abandoned my mission by the following sunset, as I finally twig nothing much happens here on Grand Cayman. The island is familial, orderly, strife-free: surprising when you consider its mere 22 miles by four miles is home to some 37,000 people. Surprising, that is, until you discover that this isle (the largest of triplets sprinkled just to the south of Cuba) was uninhabited when it first came under British control in 1655. No natives to subdue or displace. It seems even the ensuing slave labour was limited. Today there is no unemployment, no tax, no depression, no war. No policemen in sight. Less so the lager louts. With a genuinely tempting, lilting tranquility, everything is mild here on Grand Cayman. It is an island decked out in inoffensive pastels. Even the street names are dignified: Barefoot Beach Road, Paradise Lane, Snooze Lane, Friendly Lane, Dr Roy's Drive. I spy a sign for Deadmans Point. I ask our guide whether some sort of riot had broken out there. "Most unlikely," he replies. The closest we come to infamy is a tiny village curiously named Hell. Back in the 1930s, so the legend goes, a commissioner from England shot at a bird among the pointy black rocks on West Bay, and missed. "Oh Hell!" he exclaimed and so the name stuck. Hell, though, is little more than a lame, charred bed of limestone and dolomite, merchandised relentlessly by local Lothario Ivan with his must-have "I've Been to Hell" postcards and "How the Devil Are You?" T-shirts. It is evident that small things are big news on Grand Cayman. Blissfully so. As holidaymakers (and more so as holidaymakers with young children in tow) we are used to being spoiled for choice: the thrill and chaos of endless neon signs wired for our attention; the theme park overkill; the been there, done that, next! What a difference to have George scrutinise this one tiny speck on the planet under a microscope: where a stroll through the 65-acre Botanic Park, a visit to the Turtle Farm or to the Butterfly Farm takes a good two hours instead of the customary 20 minutes. Where we are conscious of every shade, of every hue, of birdsong striking from the trees like sparks from a hammer. 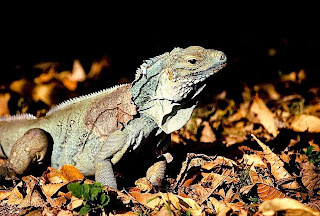 Pausing to watch a blue iguana cross the road occupies a full half hour as we eye every contour of its grizzled, palpitating frame. In George Town, the Cayman Islands National Museum painstakingly chronicles its cultural history, one major exhibit devoted to survivors of the islands' storms, another given over to children's dress-up and island plaiting. I push my luck and George responds with boffin-like curiosity. At Pedro St James, oldest stately house on the island, we tour the cool, mahogany-floored verandas virtually uninterrupted. With so few people around to distract him George announces "history is pretty cool". That, if you know my son, is earth-shaking news. Grand Cayman’s reefs have played host to tens of thousands of divers a year, yet they remain ravishingly, vibrantly alive. The island is famous for its wall diving – it is perched on the brink of the Continental Shelf where divers come to contemplate a 6,000ft abyss – far too formidable for a landlubber like me. The Atlantis Submarine tour provides an easier compromise. A chance to almost rub noses with a green turtle and a great barracuda. We descend 1,001ft for a sublime taste of canned Caribbean. Despite a fascination with every creature that swims, dives and ducks, I suffer from an embarrassing snorkeling phobia. George does not. When his childlike tenacity wins me over, I join him aboard a boat bound for Stingray City. Captain Marvin ferries us to a sand bank in North Sound where we stand up to our waists in thrashing rays, while these silky giants mug us for strips of squid doled out by the crew. Twenty minutes later and George is still refusing to get out of the water. Buoyant in his life vest, he bobs on the surface captivated by the gentle audacity of the stingrays. He reckons they are like his pet labrador at home and – providing George doesn't impale himself on the end of a waving tail, I am advised – they're about as harmless. Determined to pursue something altogether earthier, I drop George off for organised mayhem at the hotel's night camp. I pad back through the oasis of plantation-style clipped lawns, ornate hibiscus and coconut palms. Dressed to dine, the grown-ups are gathering in the Loggia Lounge for cocktails and conch creations. It is like the opening scene from some Noël Coward play in which quirky characters have ostensibly meaningful conversations, yet the real story is what is left unsaid. The waitress giggles; a bowl of peanuts spills over; a barfly orders his third mudslide. Seduction in slow motion. On Seven Mile beach next morning, a salt-scented breeze whispers among the palms. George skips through the foam, flattening the remnants of sand castles. I read. I doze. It takes me five minutes to get my scrambled head to connect with my hand and summon the waiter over. Island time is catching up with me. Finding pleasure in the things that don't happen is a large part of this island's appeal. Backpedaling furiously, of course, I'd like to point out this isn't the sort of holiday that would suit everyone. I mean, I've probably said too much already. In fact, just forget I mentioned it. We're planning another visit. We opted for the Grand Cayman Beach Suites because of their kid’s camp. Also worth considering is the four-star Sunshine Suites in Grand Cayman. Stingray City and snorkeling at Coral Gardens and the Barrier Reef with Captain Marvins Watersports (+ 1 345-945-6975). Half-day excursions, seven days a week. The Butterfly Farm (00 1 345 946 3411). Pay once and enjoy unlimited entry for the duration of your stay. Consider investing in the Heritage Passport, which offers a savings of 25 % on individual admission prices. The Passport allows visitors entrance to four of the top land-based attractions: Cayman Turtle Farm, Pedro St James National Historic Site, Queen Elizabeth II Botanic Park and the Cayman Islands National Museum.